In 1938 the de Schepper family founded a company producing spirits and liqueurs in the Belgian town of Ghent. Ten years later thes started their wine trade in Belgium. When 1950 the Saint-Emilion Château Tour Baladoz was for sale, the history of the winegrower family de Schepper began. At first, the barrels were brought to Belgium and bottled and sold there. Over the years, the familiy expanded their posessio with Châteaux Haut-Breton-Larigaudiere in Margaux (1964), Château Tayet , Bordeaux Superieur (1994), Château la Croizille , Saint Emilion (1996) and Château Lacombe Cadiot , Bordeaux Superieur (2003) , Oliver de Schepper (pictured right) has been managing the family business since 2000. In 1993, Jean-Michel Garcion (pictured left) became responsible director of all de Mour estates. He cultivates a completely classical wine style and does not shy away from the elaborate vineyard work to achieve the best possible result from every vintage. Therefore all wines of the de Mour estates are always a bank even in difficult years. In these years there is less quantity, but the quality alwasy comes close to the great vintages. As an important staple, Mr. Garcion also tries to keep the alcohol content as low as possible in his wines. The aim is to harvest physiologically ripe grapes with a potential alcohol content between 12.5 and 13.5%. This is only possible in a few regions of the world and has made the wines of Bordeaux famous. In the Médoc wineries, Jean-Michel Garcion relies on Cabernet Sauvignon. The Haut-Breton-Larigaudière usually consists of at least 90% from this grape, which is a great exception in Bordeaux. The premium cuvée "le Createur" is usually even a 100% Cabernet, which gave Jean-Michel Garcion the nickname Mr. Cabernet . Château la Croizille in Saint Emilion is a true jewel. In the best position, it is a direct neighbor of the Château Troplong-Mondot, la Mondotte and Tertre-Rotheboeuf. 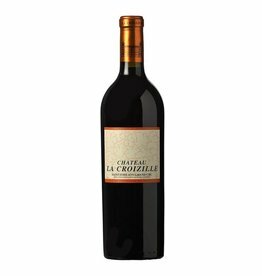 La Croizille also has the only terrace vineyard in Bordeaux. The newly created futuristic building is a real eye-catcher in the architecturally rather conservative Bordeaux region and is also open to visitors. The de Mour wines usually require a certain storage time due to their classical style, in order to show their full potential. That is why we alwasy try to have some matured vintages in our assortment.